Nothing like resurrecting an old thread. Reason for the difference in spelling is quite simple. 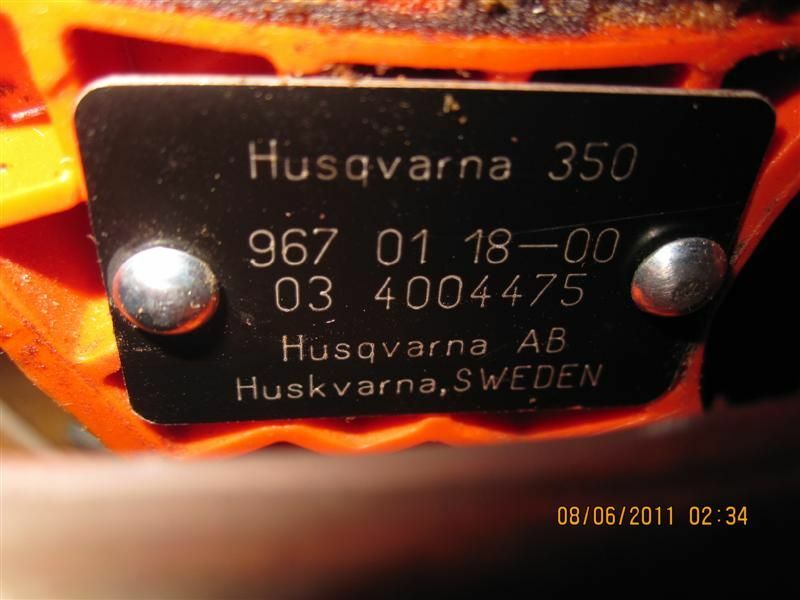 "Husqvarna AB" is the actual company name (at the time). "Huskvarna, SWEDEN" or "Huskvarna" is the place of "Manufacturing" or the City name. Thank you for deciphering the Manufacturing Dates. Does it say xp anywhere on it? All I can say about that one is that it likely was made before 1982. I don't know how to date the ones that old. Tor R and westcoaster90 like this. ok thanks ST.. shes a moldy oldy then. ray benson, Tor R and VinceGU05 like this. While reading this thread I saw the question posted about the spelling of the town - if it had been changed. It was. Here is a link to the Husqvarna page. Welcome to the site! No Apology needed we all have to learn some how. 20th week (2nd &3rd numbers) of 1991 (first number with that black tag). 1455th saw produced that week (last 4 numbers). ray benson and SawTroll like this. Thanks RedFirDown. You know your stuff. Friend of mine gave me two old saws to fix. One a Jonsered, which he had back, the other is a Husqvarna 61 grey top (think that's the right term). He gave me the 61 in payment for sorting out the Jonsered......bargain I thought! Serial number is 6330487 on a silver plate - the plate also has Elelectrlux Motors Sweden on it. I used it for the first time the other day as my little Stihl 211 was playing up. I was amazed at how good it is and will be using it as my first choice from now on so was hoping you guys could date it for me? 487th built in the 33rd week of 1986. Yes, the number system has changed several times.